Buy any large bag of Fromm dry food, get 2 FREE cans of Fromm wet food. Act fast! Offer valid for this month only. We are now searching for exceptional pet lovers to join our Pappy's family! “I would highly recommend Pappy’s Pet Lodge and I have since used them again with the same result. Stella Long’s parents knew they wanted an Aussie for their intelligence and loving personality, and with Stella they got exactly what they wanted! Stella is often too smart for her own good. She knows all the basic commands, plus she can go get a specific toy by name. She loves playing hide and seek. Stella will also play “find it” with treats hidden all over the house! She loves all toys, but cat toys are her favorite. Stella is a great dog and loves everyone. She is always the life of the party! She even wants to be friends with her family cats; however, they want nothing to do with her! The biggest struggle her owners have overcome is her Aussie energy! 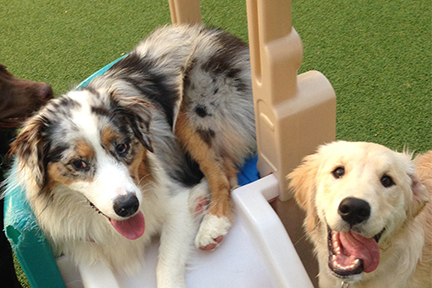 Luckily, Stella is able to come for daycare a couple times a week for her to play, which has really helped! Stella comes to our Roanoke location for daycare, grooming, and lodging. Our staff absolutely loves having her! Congrats to Stella for winning our Pet of the Month Contest. She received a prize of her choice and a $50 credit on file! Stay tuned for our next contest in a couple weeks!